SVS College of Engineering, Coimbatore has advertised in THE HINDU Opportunities newspaper for the recruitment of Professor / Associate Professor / Assistant Professor Plus Non-Faculty jobs vacancies. Interested and eligible job aspirants are requested to apply within 10 days from 22nd November 2017. Check out further more details below. 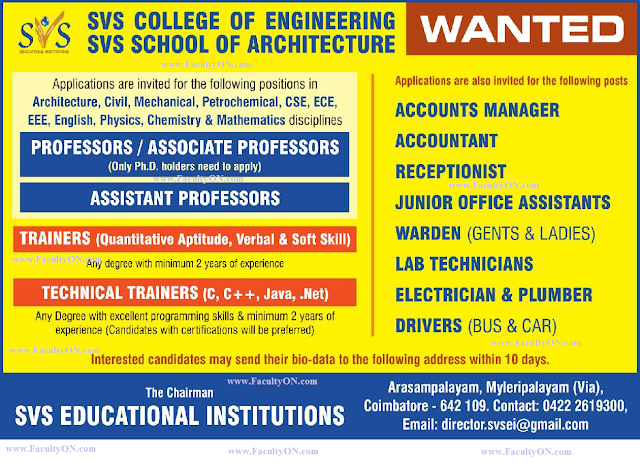 About College: SVS College of Engineering, Coimbatore, an ISO 9001:20008 Certified Institution affiliated to Anna University is one of the foremost institutions founded by Thiru.S.Chandrasekaran. It was established in the year 2009 under Sri Velammal Subbiah Educational Trust, located at 2.5KM from Coimbatore - Pollachi National Highway, is continuously being monitored by the Vice Chairman Mr.B.Raghavendran. The courses offered in SVSCE are approved by the All India Council for Technical Education, New Delhi. SVSCE offers six undergraduate programmes and three postgraduate programmes in Engineering.The campus in spread over 36 acres of land utilized for the College Hostels, Play Fields and Gardens. How to Apply: Interested and eligible candidates are requested to send their CV along with copies of certificates and a recent PP size photo to the following postal, address or email address.